After two weeks of using the new Dell Inspiron 1420N with Ubuntu, I decided it’s time to write down some of my thoughts about this new Linux offering from Dell. I have quite a lot of experience with Ubuntu and with Linux in general. I administer several Ubuntu servers including an Edubuntu terminal server setup in a computer lab. I’ve been using Linux off and on for about 8 years and have seen desktop Linux improve greatly in the last few years. The time seems right for a company like Dell to partner with a distribution like Ubuntu and bring Linux to the masses. Unfortunately, Dell and Ubuntu’s parent company Canonical have not worked together closely enough to make this a first-rate offering. While I think the 1420N is a great computer overall, the lack of attention to detail (and unbelievably bad driver support) keep these latest Linux offerings from being ready for the general public. Hopefully Dell and Canonical will resolve these problems and make a truly great product that I could feel comfortable recommending to family members who are not familiar with Linux. Having used a Macbook for the last year, I was not initially impressed with the 1420’s design. Apple has made the industrial design of their computers into such an art that any other laptops look bad in comparison. However, when compared with other PC notebooks, the 1420 is very nice. It looks nice sitting on my desk and is comfortable to use. One place where the 1420 design outshines the Macbook is in heat management. If you’ve ever used a modern Apple notebook, you’ll know that they become extremely hot and it’s nearly impossible to use them on your lap. The Dell 1420 has a fan that blows hot air out the left side of the notebook and keeps the bottom of the notebook very cool. You can comfortably use the 1420 on your lap for hours without the machine overheating. The keyboard feels nice and has good tactile feedback. The extra buttons like “delete”, “page up” and “page down” are placed in reasonable locations considering the normal lack of space on notebook keyboards. The extra media keys work well to control the volume and navigate media in Totem and Rythembox. The power button conveniently brings up the Gnome logout menu (this can be changed to preform other tasks via the Gnome Power Manager). I upgraded to a higher resolution glossy screen. While the 1440x900 resolution is nice, I wish it was available with a non-glare coating. Colors look noticeably different when compared with a Macbook and with computers running Windows XP. This could simply be a difference between the way Linux and other operating systems handle color or might possibly be a problem with the video driver (more on that later). Overall, the screen is very nice and one of the first notebook screens that doesnâ€™t make my eyes hurt after hours of work. Getting the Bluetooth up and running was not easy. Most of the necessary software was installed by default, but I still needed to install extra software and edit configuration files to make anything work. With some tweaking and the help of these instructions, I was able to send files to and from the my Sony Ericsson w810i and Nokia N800. Iâ€™ve heard that it is possible to use the w810i as a modem in Linux, but with no graphical interface for these type of connections, it’s not very useful for the average user. The 1420 WiFi works well with unsecured and WPA secured networks. NetworkManager has problems connecting to WEP encrypted networks. Lack of good WEP support is annoying and severely limits Ubuntu’s ability to connect to public access points. I was surprised at the high quality sound card included with the 1420. When listening with headphones, no noise is noticeable and audio sounds very clear. The inclusion of two headphone jacks and a microphone jack on the front of the machine is a nice touch. Getting a microphone to work was not quite so easy. There are holes in the case above the screen that appear to be for a built-in microphone. If there is a microphone back there, I was never able to get it to work. I was able to get an old headset working when I plugged it into the microphone port on the front. Unfortunately, Ubuntu and Dell have not included an audio mixer for adjusting the input volume. I needed to hunt through the Synaptic package manager for a mixer and install it before I could get the microphone volume loud enough to make Skype calls. A little bit of customization and package pre-installation on Dell and Canonical’s part could take using microphones from annoying to a great experience. Watching unencrypted home recorded DVDs is no problem and you’re prompted to install the proper codecs when the first DVD is inserted. Burning simple data and audio CDs and DVDs is also very easy with the built-in tools. It would be nice if Dell included more robust burning software (perhaps Nero Linux) and DVD software capable of playing commercial DVDs without installing software of questionable legality (at least in the US). Every page where Dell advertises the 1420N should include a bright red notice to warn potential buyers that Ubuntu currently has no 3D video driver for the integrated Intel X3100 graphics card. Trying to use 3D applications such as 3D screensavers or enabling Desktop Effects (aka Compiz) will instantly freeze the window manager and leave you with little choice but to forcibly power down the computer. Even the external monitor port (VGA) does not work! Intel has released drivers for the new Santa Rosa mobile platform (including the X3100 integrated graphics), but these drivers are not supported in the current version of Ubuntu. This is the age-old story of poor Linux driver support for new hardware (and I’m sure everything will be supported once Gutsy Gibbon is released in October). It does seem that two companies like Dell and Canonical could find a solution to this problem other than shipping unsupported hardware. Why couldn’t Canonical push out the necessary video drivers for Dell owners? Shipping notebooks with no 3D video support is simply unacceptable. If Dell and Canonical want to reach more users and be taken seriously, they need to step up their cooperation and start shipping computers that work correctly out of the box. The hibernate and suspend functions worked well out of the box. However, after a few hours of use, these functions stopped working. Thinking I had probably installed something that messed things up, I used the Dell utility (available in the GRUB startup menu) to restore the notebook to its factory condition. After the 15 minute reinstall process, hibernate and suspend worked again. Unfortunately, without installing any additional software, the computer quit hibernating and suspending correctly after a few days. Trying either of these functions completely freezes the OS and forces you to hard reboot the notebook. This is another problem that Iâ€™m sure will be fixed in Gutsy. 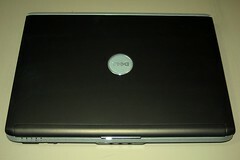 Overall, as a Linux geek, I’m very happy with my decision to get the Inspiron 1420N. The notebook is by far the fastest I’ve ever used (it could be even faster with a 7200rpm hard drive) and it’s comfortable to work with on a desk or on your lap. The price (depending on what coupon codes you can find) is reasonable and comes in quite a bit cheaper than a Macbook. Unfortunately, Dell and Canonical have fallen short of releasing a truly great product. With just a little extra work and closer attention to the pre-installed software and drivers, they could be shipping the perfect Linux notebook. The way it is now, I wouldn’t recommend this notebook for anyone who’s not a seasoned Linux geek.